June 7, 2018 - Fairport, NY, USA: Saelig Company, Inc., (Saelig) (www.saelig.com) announces the availability of the TekBox TBMDA2 / TBMDA3 Modulated Wideband Power Amplifiers, which are designed to create an inexpensive signal source for pre-compliance immunity testing of electronic PCBs and products. Driven by the tracking generator output of a spectrum analyzer, they provide the increased RF power outputs required by many test environments. With an input power range of up to -8 dBm / 0 dBm, these amplifiers can boost the output power of a tracking generator up to 500 mW / 5 W or 40 dB from 10 MHz to beyond 1 GHz. 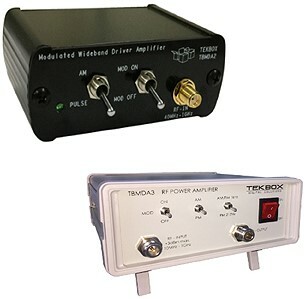 In addition to other applications, the TBMDAx amplifiers are ideal for driving TekBox near-field probes in order to detect problem areas of an electronic circuit or to create electric fields up to 550 V/m when driving TekBox TEMcells. Test signals for immunity testing can be CW or AM/PM modulated. These amplifiers include built-in modulation capabilities to generate 1 kHz AM or PM signals. In PM mode, the TBMDAx amplifiers can also generate a 217 Hz Signal with 12.5% duty cycle in order to simulate mobile phone TDMA noise. The TBMDA2 is powered by external 5V and consuming around 3.5 W, and the TBMDA3 is powered by external 100-240 V and consumes 20 W.
Created by EMI experts TekBox, the TBMDAx amplifiers are available now from their authorized North American distributor Saelig Company, Inc. Fairport, NY.